First meeting of 2013- Challenge time! I hope you enjoyed the holidays and were able to spend at least some time quilting! I was able to get a few things done myself. Now, it’s time to kick off the new year with some quilty fun! Our first meeting of the new year is this Wednesday, Jan. 2 at 7pm at Milhopper Branch Library. I’ll be handing out some fabric (fat eighths) for our new challenge and I hope you can make it. The challenge theme is “Storybook.” We’ll all take some kind of storybook inspiration (anything you want) and create a quilt (any size) using Madrona Road by Violet Craft for Michael Miller fabric. The only other fabrics you can use in the quilt are solid colors and/or more Madrona Road fabric that you buy on your own. We will be working with the Ocean Palette of the fabric line but you can any fabrics from the line you want. 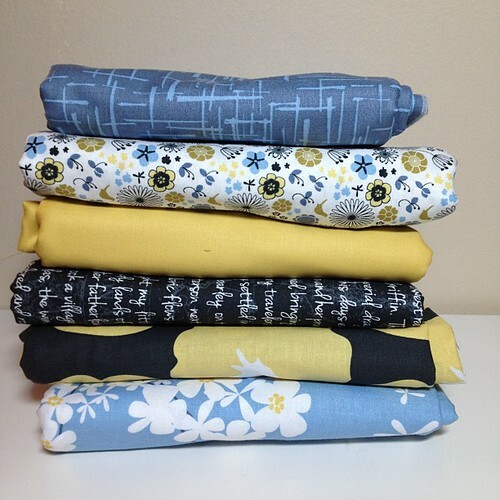 We (Central Florida MQG) distributed our fabrics December 6, and already have a couple finishes among our 16 quilters! FYI… Inspiration! quilt shop in Plant City also carries the Ocean colorway of Madrona Road. Hi Linda! Thanks for the info! This is the 3rd MQG challenge we participate in and are very excited about it! Our December meeting was a holiday party and didn't have everyone present so we waited until Jan. to hand out fabrics. Can't wait to get started on mine!